+2 Cards. Put this into your hand. 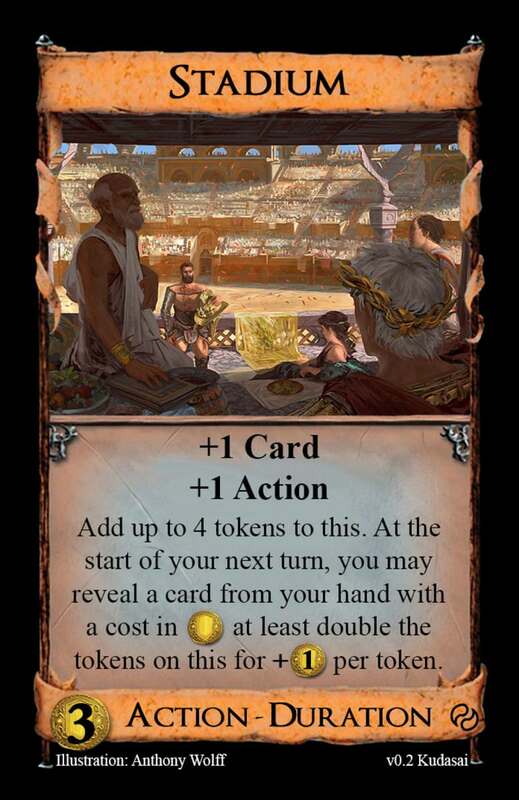 Create a balanced card costing up to $6 with either "Do this any number of times" or "You may play this again" in this card text. Discard a card for +1$ or trash a card from your hand. I guess the challenge isn't as interesting as I thought. You'd could trash the same Fortress over and over again to get infinite points with Tomb, but broken 3 card combos aren't anything new. I think it's a great challenge! Every loop should have a way for it to end though or a player could technically keep their turn going indefinitely. But as these cards will only be played in physical games with friends, I think it's fair to ignore this. [EDIT 10/13/2018] Changed the wording to be more clear. Interesting. Looks like another take on Asper's legendary/infamous Road card. I like the concept, but I think the issue people run into is if a card like this has a +1 Action token on it, or if you have Champion in play, one of these will draw your whole deck. In this case you could draw your whole deck and get +3 Actions. Beyond that I think the second option should give +3 Actions. Otherwise, if you have 2 of these and play the first as +2 Actions and the second as +2 Cards, you will have ended right back to where you started (5 Cards, 1 Action). With +3 Actions you could play the second Ferrier again and end up with 6 Cards and 1 Action. Essentially you are rewarded a Laboratory play for pairing the 2 Ferriers. I'm sure it's been discussed, but I wonder if someone has come up with a fix for how cards like this interact with Champion and such. In other words, I wonder if there is a card instruction that would make it exempt from getting the +1 Action. I think you missed that the second Ferrier that is played for draw always comes back to your hand. So 2 Ferriers net draw one card (+2 Actions, +2 Cards, Ferrier comes back to hand) whereas 2 Ferries of the +3 Actions version net draw 3 cards (+3 Actions, +2 Cards, Ferrier comes back to hand, +2 Cards, Ferrier comes back to hand). This is clearly too good for $4. I don't know how good the +2 Actions version is and whether it is too weak at $4 (it definitely looks weaker than Asper's Town/Road) but I guess that it can be used as "half-Lab" in a mono-card strategy as we just analyzed but also as consistency-increasing sidekick in a draw engine. This is a great idea! Not that this is a surprise anymore when you come up with a new card. I only fear that Lost City for me, VP for the others is a bit too weak. My totally uneducated hunch is that this would be OK if there were 1/2 VPs. On the other hand it makes perhaps more sense to read this as a cheap $2 cantrip with a bonus for everybody that you only want to use a few times, during crucial moments. You know you can play Bivouac an arbitrary number of times, right? Eh, I mean, that's the challenge. Of course you know. That said, it's a pretty clever design. Thank you both for the praise! I'm not sure if the values are correct; I just threw this together more to highlight the concept. The "+1 Card and +1 Action" can probably be replaced with anything that you might want a lot of and the "+1 VP token" could just as easily be "+1 Villagers" or "+1 Coffers." The cantrip option is safest though as it does not deplete any piles or give infinite money. +1 VP token per play after the first is pretty generous, but then again so is potentially drawing and playing all the cards in your deck. Also, I changed the wording to be more precise. Still plays the same though. I see that Farriers played for +2 Cards return to your hand. I'm just saying that if you play a Farrier for +2 Actions and then +2 Cards you end up right where you started (5 Cards and 1 Action). You still have a Farrier in your hand, but the +2 Actions essentially did nothing. You can now play the Farrier again for +2 Cards, but your now only up to 6 Cards and no Actions. That's two $4 cost cards played for a Moat play. But maybe this is designed not to draw without other Villages or Draw cards. If so, this should cost a lot cheaper. I think Bivouac is nicest if it gives VP to your opponents. Otherwise putting the +1$ token on it (together with some way to generate enough buys) will mean you can empty the Province pile, which will make whatever the other players get pointless. Ahh, I see now. Apologies to you and Holunder9. Ahh, nice catch! I think it's best to make sure Bivouac doesn't interact with tokens. I think this version (v0.3) clears this up. I don't actually mind it as long as it doesn't pay, which I think should be the case here. Note that your change makes the card weaker, as now you need to decide upfront how many Cards/Actions you need. Do this any number of times: each other player gets +1 Coffers and for each card you've gained this turn, +1 Villager. It was not my intention to make Bivouac weaker, but I think I'm okay with this. Now there is even more incentive to know your deck and how much you need to draw, versus just mindlessly drawing until your hand is good enough to win outright. Also, grabbing more than a few Bivouacs now makes more sense. turn, +1 Villager and each other player gets +1 Coffers. Really interesting card! Attaching a scalable property to a potentially infinite loop is a great idea! 1:1 on Villagers to Coffers is pretty bad, but 2:1 and 3:1 is probably quite good. In Kingdoms without extra gaining, this seems rarely worth getting though. Perhaps only if there are also no Villages (splitters). I think Dominion is diverse enough that this would rarely be an issue. If it did prove too weak at a 1:1 you could try reversing the tokens. You get +Coffers and everyone else gets +1 Villager. Amassing any amount of Coffers is dangerous though, even if you have to wait a turn to use them. Not sure why it has a "for each card you've gained" but I love it - tying something with diminishing returns for you with something with less diminishing returns for them. Here's a challenge. Design a card where you get to pick a number. Example: Pick a number. Reveal the top card of your deck. If it costs that many coins, put it into your hand. Thanks, I changed the wording. I think that the other way around, you get Coffers and they get Villagers, is far too good. Cool challenge though. I'm going to have to think of some more cards along these lines. Excited to see what others come up with. As for your card idea, I like it. A cantrip version would be interesting, but maybe too similar to Wishing Well. Pick a number. Each other player with 4 or more cards in hand discards a card costing exactly that many $ or reveals a hand with no such cards. With cards where you pick a cost, this could maybe be broadened to "name a cost" to include Debt and Potions. This looks like it could cost $5 easily, maybe even $6. With any decent trashing, seems like it'd be easy to make this an always-activated conspirator. I love this card because half the people say it's terrible and the other half say it's too good. In reality I think it's about on par with Silver. Stadium certainly benefits from a good trasher, but I think most cards do. Increasing the price to $5 or $6 would actually buff this, as it would help enable itself to hit those $2 and $3 Coins for your next turn. At cost $3, massing Stadiums just gets in the way. If I were to ever nerf this, I would first adjust the cap on how much coin you can make for your next turn to $3. I seem to have killed the thread. Here's a better, shorter challenge. Make a weird Reaction card, in that something about it is unlike (at least almost) all other Reaction cards. Maybe it's a new type combination, maybe it has a new trigger, maybe what it does is just odd, maybe it's just a Reaction, etc.